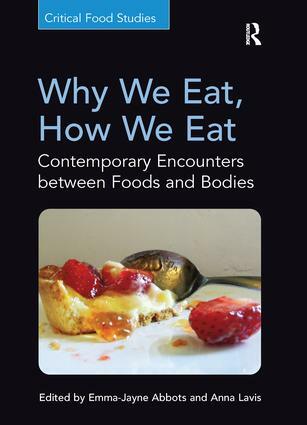 Contents: Introduction: contours of eating: mapping the terrain of body/food encounters, Emma-Jayne Abbots and Anna Lavis; Part I Absences and Presences: How We (Do Not) Eat What (We Think) We Eat: Invisible foodscapes: into the blue, Kaori O’Connor; The substance of absence: exploring eating and anorexia, Anna Lavis; Home and heart, hand and eye: unseen links between pigmen and pigs in industrial farming, Kim Baker; Interlude: Eating practices and health behaviour, Simon Cohn. Part II Intimacies, Estrangements and Ambivalences: How Eating Comforts and Disquiets: Advancing critical dietetics: theorizing health at every size, Lucy Aphramor, Jennifer Brady and Jacqui Gingras; Eating and drinking kefraya: the karam in the vineyards, Elizabeth Saleh; Negotiating foreign bodies: migration, trust and the risky business of eating in highland Ecuador, Emma-Jayne Abbots; Interlude: Reflections on fraught food, Jon Holtzman. Part III Contradictions and Co-Existences: What We Should and Should Not Eat: Chewing on choice, Sally Brooks, Duika Burges Watson, Alizon Draper, Michael Goodman, Heidi Kvalvaag and Wendy Wills; ’It is the bacillus that makes our milk’: ethnocentric perceptions of yogurt in postsocialist Bulgaria, Maria Yatova; The transition to low carbon milk: dairy consumption and the changing politics of human-animal relations, Jim Ormond; Interlude: Reflections on the elusiveness of eating, Anne Murcott. Part IV Entanglements and Mobilizations: The Multiple Sites of Eating Encounters: Confessions of a vegan anthropologist: exploring the trans-biopolitics of eating in the field, Samantha Hurn; Metabolism as strategy: agency, evolution and biological hinterlands, Rachael Kendrick; Ingesting places: embodied geographies of coffee, Benjamin Coles; Complex carbohydrates: on the relevance of ethnography in nutrition education, Emily Yates-Doerr; Interlude: Entanglements: fish, guts, and bio-cultural sustainability, Elspeth Probyn; Index. Emma-Jayne Abbots is Lecturer in Social/Cultural Anthropology and Heritage at the University of Wales Trinity St David and Research Associate at the Food Studies Centre, SOAS, University of London, UK. Anna Lavis is Research Fellow at the School of Health and Population Sciences, University of Birmingham and Research Associate at the Institute of Social and Cultural Anthropology, University of Oxford, UK.